Along with the very out of left field reveal of the upcoming Ghostbusters/Transformers crossover figure Ectotron, we had news that Ectotron himself was set to star in a 5-part miniseries described as his "origin story" coming out this summer. Well, after the figure itself sold out very rapidly at Hasbro Pulse and with pre-orders beginning to pop up on sites outside of Gamestop, his exclusive retailer, we have some new information on the upcoming crossover comic! The comic, set to debut in June of this year, is described as an adventure where the Transformers pick up some weird Cybertronian signals emanating from Earth, and upon arrival, they find that the strangeness is only just beginning. But it seems they don't have to worry too much, as the Ghostbusters are the perfect humans to help them! Which is a good thing, cause it looks like everyone's favorite Transformers ghost, known as Starscream, might be involved somehow. The series will feature Erik Burnham, Dan Schoening, and Luis Antonio Delgado, who are associated with the upcoming IDW Universe reboot coming to us next month too. It will also feature cover art from Dan Schoening, Paulina Ganucheau, Nick Roche, and Alex Milne. This information all came to us from an io9 exclusive article, and you can find both artwork for the series and some snippets of the article itself below! 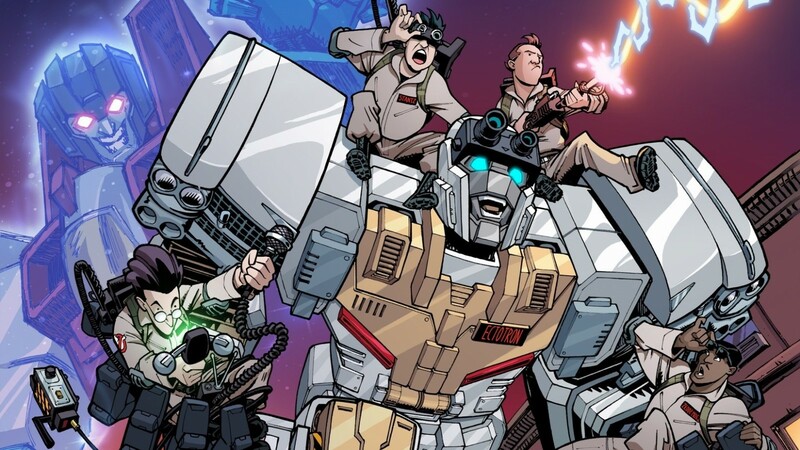 Following the news of Hasbro’s Transformers and Ghostbusters toy collaboration, IDW Publishing has its own team-up to debut. The two franchises are set to cross over in a new comic book miniseries from Erik Burnham, Dan Schoening, and Luis Antonio Delgado—the creative team behind the publisher’s Transformers comics. When the Transformers pick up on a strange Cybertronian signal emanating from Earth, they travel to the planet only to discover that the threat waiting for them there is something that Venkman, Spengler, Stantz, and Zeddemore are perfectly suited to help them take on. how did i not think that was going to be in this. If I can find it on clearance at GameStop after it comes out I'll grab one. Otherwise it seems a bit pricey to me. Won't be as good as this epic crossover! If you're a kid of the 80s, then you were likely excited by the news from Toy Fair that there is going to be a mashup of two of the decade's most recognizable franchises: our own loved Transformers; and Ghostbusters! 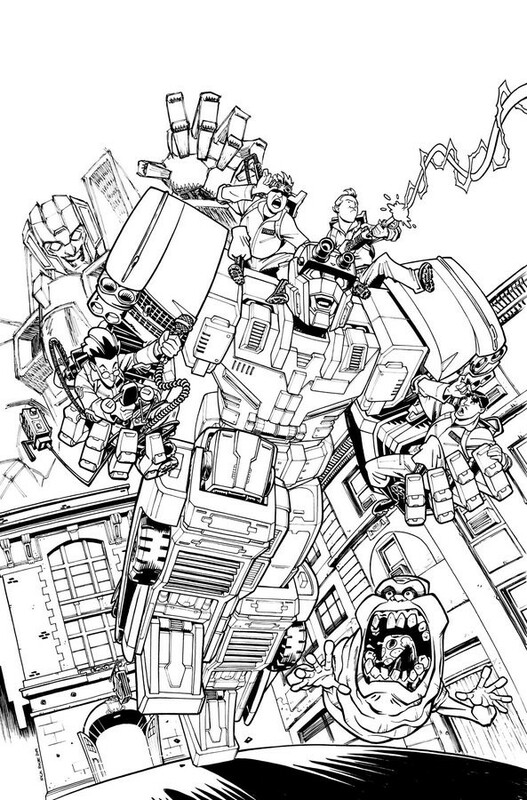 Below, for your viewing pleasure, is a piece of work done by fan favorite artist and writer Nick Roche, perhaps most famous for his work on IDW's Wreckers trilogy. 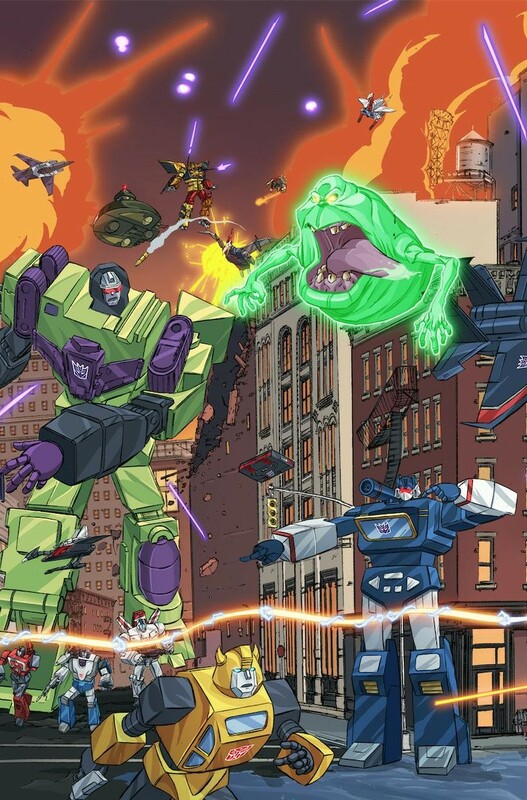 Posted to Twitter, It features not only the newest Autobot, Ectotron, and his Ghostbusting buddies, but also the two most famous ghosts of both franchises: Slimer and Starscream! As a bonus from Mr.Roche's own Twitter, we also have line art of the piece. The series is due in June, and while it's not known if the above art is going to be featured as a main cover, it's still a fun piece. What do you think? Are you excited to see Roche back on Transformers storytelling and art? Excited for the crossover in general? Let us know what you think below, and stay tuned to Seibertron for all your Transformers news! The panorama picture and toy have a nose, this one looks like it doesn't, unless it is the odd angle. Good day, Seibertronians! 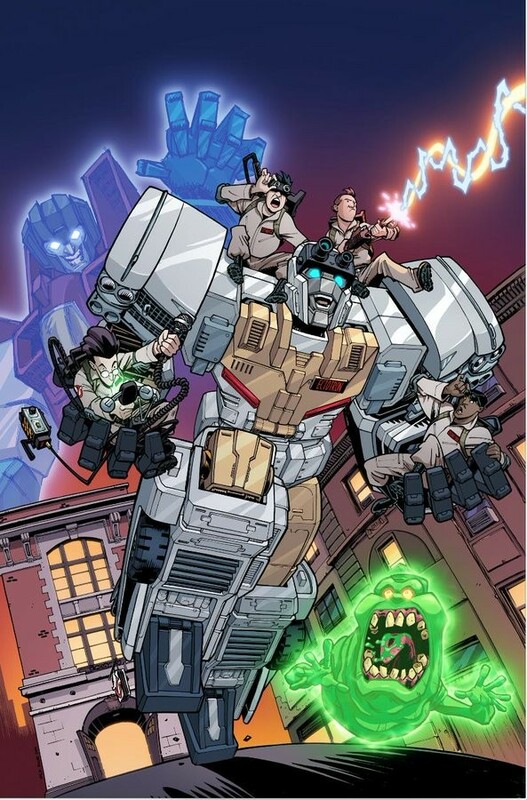 Straight from the Twitter of IDW Creative Development/Senior Editor Tom Waltz, we have an official reveal for the covers for the Transformers X Ghostbusters comic miniseries, save one odd exception. Issues 1, 2, 4 and 5 were provided by Waltz, all drawn by IDW Artist Dan Schoening, but issue 3 is oddly absent. Waltz lampshades this himself, claiming issue 3’s cover is “TOP SECRET”. Regardless, astute viewers will recall we have actually already seen each of these covers, granted in a different form. The covers were priorly revealed as a mural at New York Toy Fair 2019 last weekend, including the missing third issue cover. As is the case here, the “SECRET” is also censored in the mural, but one can make assumptions regarding the expunged material. All four covers are provided below. Transformers X Ghostbusters: Ghosts of Cybertron is slated to hit shelves this June, so be sure to stay tuned to Seibertron.com for more Transformers news and reviews. I can not be the only one who noticed that. On the second picture, on the very far right, you can see what appears to be a silver and black Optimus Prime decked out with his energon axe. Is that the rumored Ghostbusters MP-10 repaint we had listings for? I know these are only covers, but Starscream being a ghost, obviously makes sense based on his past incarnations. 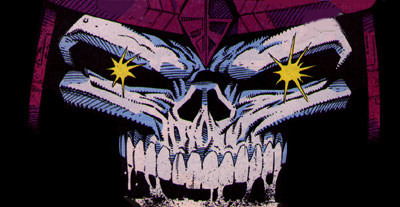 However in another cover he appears to be alive and well, and Astrotrain is a ghost? He never died in any prominent fiction I recall...(??) Oh well, still looks fun. Motto: ""Fools! To a master of Metallikato, your clumsy attack is almost slow motion!"" 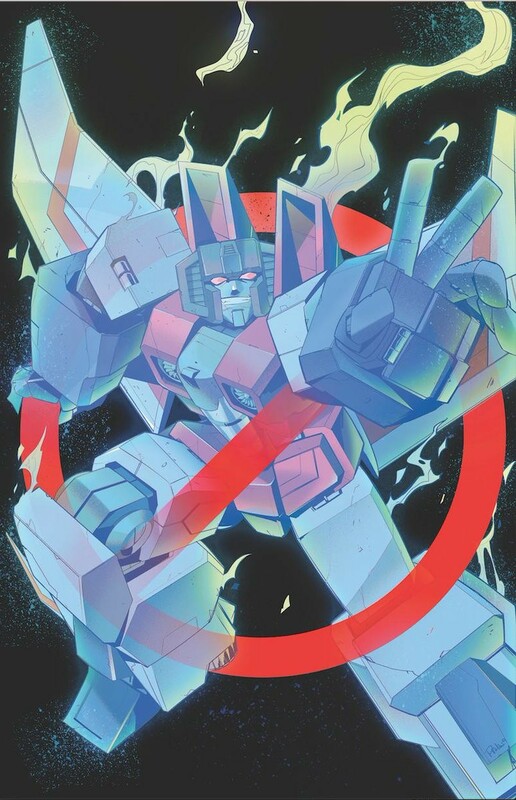 o.supreme wrote: I know these are only covers, but Starscream being a ghost, obviously makes sense based on his past incarnations. 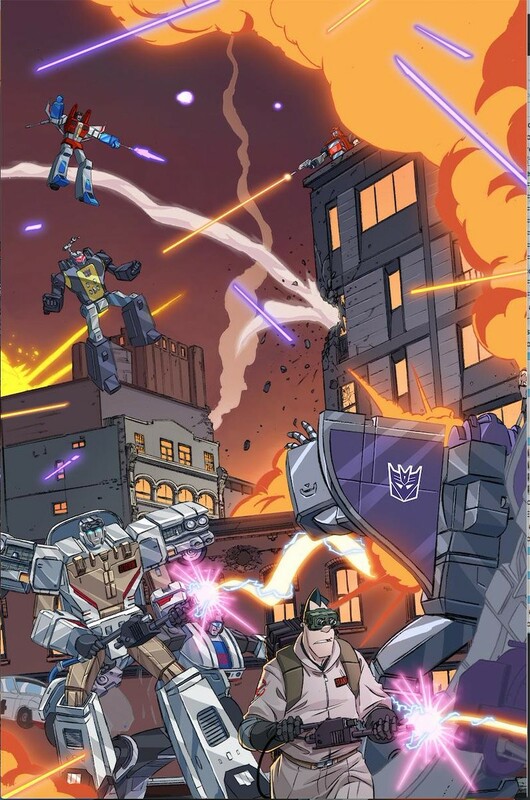 However in another cover he appears to be alive and well, and Astrotrain is a ghost? He never died in any prominent fiction I recall...(??) Oh well, still looks fun. Motto: ""It takes an irritant to make a pearl."" "So how big is this Exgraver, anyway? Deluxe or Voyager?" "I'd say he's a couple of BIC pens tall." "Wha-- What?" Nathaniel Prime wrote: A silver and black Optimus Prime decked out with his energon axe. Is that the rumored Ghostbusters MP-10 repaint we had listings for? Makes me think it’s Prime in Megatron colours. Silver arm ant torso? Black legs and red accents? I think it’s a mega Prime. So true! Maybe mirror universe prime? I just have to give kudos to the art8st who decided Grimlock needed to be holind Thundercracker in his jaws like a fetched stick. 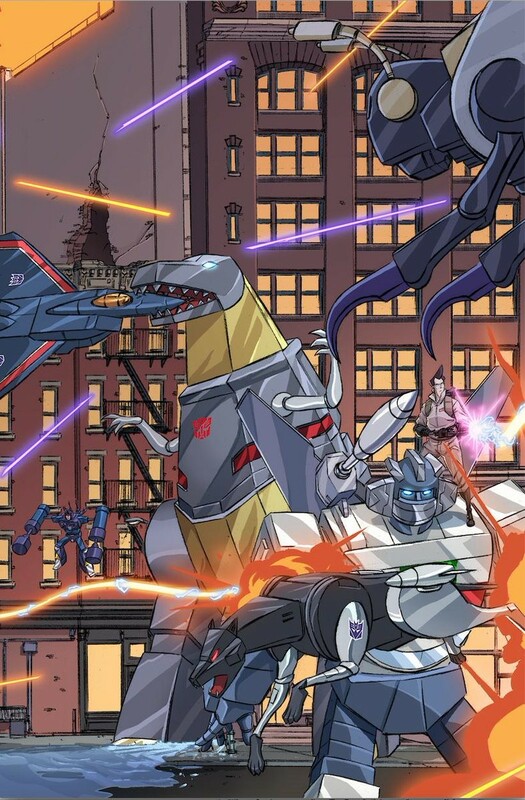 The panorama view in one of these other posts that has Prime blacked out shows Blitzwing wielding Megatron, all 4 Ghostbusters are accounted for too, so I guess no Egon Prime. The little antenna showing under the T makes me think Prime just axed an insecticon. Super glad to see Roche's full artwork, it looks so good! Also really happy we are finally potentially going to see that Ghostbusters MP-10 crossover figure in the comic, that is rad! Hoping it really does turn out cool! hmm...ok, it just seems confusing, him getting blasted with the proton pack, and having the same glowy effect as Slimer on the other cover. 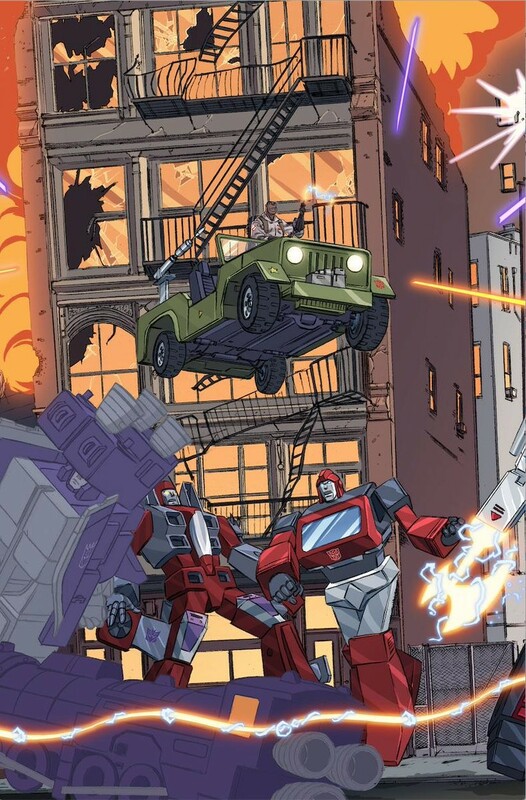 In the exciting world of crossovers, we have a bunch of news to share with you today regarding the upcoming Transformers/Ghostbusters crossover event! We'll start with the brand new cover revealed to day via Tom Walt's Twitter, which features the Ghost of Starscream! The Senior Editor and Manager notes that a Ghostbuster's crossover without Starscream's ghost would be a crime in and of itself! The cover itself is done by Priscilla Tramontano, a seasoned Transformers art veteran. To go along with the cover, IDW's official site has uploaded a new interview with the creative team behind the crossover itself! The creative team consists of Writer Erik Burnham, Artist Dan Schoening, and Colorist Luis Antonio Delgado, and the team gets to talk about their histories with the different franchises, and also give us a bit of information on Ectotron. You can follow the above link to the full interview. You can check out the cover and read some snippets of the interview below, and let us know what you think of this new and exciting crossover evens in the comments section down below!! When you were initially approached by IDW Publishing to be part of the TRANSFORMERS/GHOSTBUSTERS crossover, what was your first reaction? ERIK BURNHAM: Oh, there was a delayed double-take. The TRANSFORMERS property is something that a reliable section of fans has asked about us playing around with (with GHOSTBUSTERS or otherwise) ever since the first TMNT/GB crossover five years back. I wondered if the TRANSFORMERS universe would be as fun of a sandbox as GHOSTBUSTERS for us to play in – spoilers, it totally is. LUIS ANTONIO DELGADO: Excitement! I’ve been working with IDW for 11 years and I’ve worked on pretty much all the properties I grew up with. The one I was still dreaming of being a part of was TRANSFORMERS, and to do it combined with my favorite team, the Ghostbusters, was everything I could’ve wanted. Besides, I already knew Erik was gonna come with a fantastic way to get both of them together (already did it once with TMNT), so I couldn’t wait to read the story. DAN SCHOENING: Very surprised! I never thought I’d get the opportunity to draw the TRANSFORMERS bots in a comic, let alone a team up with the Ghostbusters. Luis, with so many different characters appearing on the cover art and within the story pages, how do you keep track of the proper colors to use for each, and did it require a lot of research on your part to get all the TRANSFORMERS details right? LUIS: It is a huge challenge. When it comes to GB, I know the guys and their gear better than I could ever imagined I would, but the TRANSFORMERS bots are a different story—there are so many and they are so complex that it is a bit scary. Dan is the real genius behind all the art, not only the pencils, he did all the research so he could be true to the mythos and he was kind enough to share that research; so after a couple of misfires, I managed to get all the robots’ features right and now I have multiple files ready for when I have to work on them. Dan, who is your favorite Ghostbuster to draw? Favorite TRANSFORMERS bot? Are there any characters you dread having to illustrate? DAN: My favorite Ghostbuster is Ray, and he’s also my favorite to draw. As for a TRANSFORMERS bot, my favorite is Mirage, with Perceptor in a close second. I can’t say I’m dreading drawing any, however, each one presents their own unique challenges. Finding where the joints move in particular, such as elbows and knees, is something I’m looking to improve upon as I move ahead. Erik, what can you tell us about Ectotron, the new Autobot being introduced in this crossover? ERIK: Well… he is a bit of a nerd. He’s almost as far out there for the Autobots as the Ghostbusters were from other academics here on Earth. He’s kind of uptight, and he’s teased by the other Autobots. But he’ll loosen up by the end of the story. Erik, what can longtime fans of both franchises expect going into this crossover? ERIK: Here’s the thing – I like a little comedy with the action, and I was wondering if Hasbro was going to ask for a very stoic interpretation of the TRANSFORMERS property, leaving the silliness to the Ghostbusters… but no. I get to have fun with the bots! Nothing wildly out of character, mind you, but Optimus Prime is gonna be as able to crack a joke as Venkman, if the situation arises. It’s gonna be about fun. Lots of fun. And I guarantee the series starts in a way no one will expect – it made me smile to write, and Dan & Luis knocked it out of the park on the page. It’s the kind of toybox mashup we did as kids! The TL;DR of it: a fun time with the boys in grey and the robots in disguise dealing with some ghostly common enemies! Ectotron should be very interesting. S.o.L. wrote: Ectotron should be very interesting. 4,456 pages were recently viewed by 526 unique visitors. This page was viewed 1 times on Wednesday, April 24th 2019 6:49am CDT. © 2019 Seibertron, Inc. DBA Seibertron.com. All Rights Reserved. Established June 2000. Seibertron.com is owned by Ryan Yzquierdo.